Jillian Steinberger owns and operates The Garden Artisan, an ecological landscaping company which designs, builds and maintains native and edible gardens that attract humans and pollinators, both. 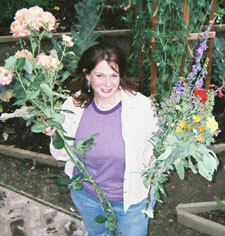 She also writes articles on landscape gardening, ecology, and farm-to-table issues for magazines and newspapers. She has an M.A. from the University of Wisconsin — Madison, where she studied philosophy of aesthetics. She also attended Bard College in New York, and earned her Permaculture Design Certificate at Merritt College in Oakland. She divides her time between the East Bay and Santa Cruz, California, and landscapes in both areas. Contact her at jillian@garden-artisan.com. 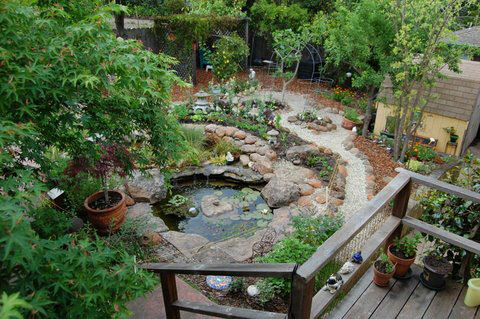 The Garden Artisan respects natural processes and works in harmony with the SF Bay ecosystem. We ask: How may your outdoor spaces sustain you, and support the beneficial flora and fauna found in vital, thriving gardens? This approach moves beyond the post-WWII era, which still dominates the landscaping industry. Unnecessary inputs like pesticides and hi-nitro fertilizers create garden “addicts” that require much cheap labor and precious water to create a semblance of surface level health and beauty. Our goal is to provide longer lasting value. 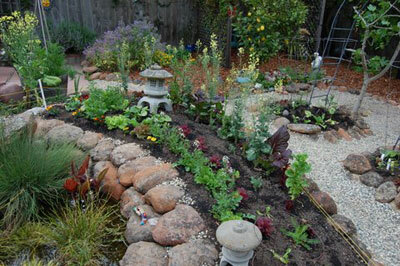 Gardens that are dynamic, living systems stay healthy and beautiful naturally. We help you reap the bounty of your land—whether that’s a container garden on a patio or the grounds of a spacious estate. We steer clear of chemical exposure, wastefulness, and a Disneyland view of the garden, and bring aesthetics into alignment with modern realities and ethics. Ecological softscaping is a low-input, high-yield solution, with great flexibility for your changing needs over time. What Is a Permeable Softscape? Things don’t always have to be so hard. With softscape methods structure is found within the landscape, not imposed upon it. Working with what’s already there, a site’s inherent strengths are emphasized to support usage needs and aesthetics. Natural systems remain intact. By maximizing permeable space, softscapes retain moisture, biomass and nutrients, resulting in a thriving soil microbiology. 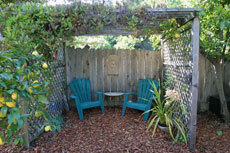 The result is immense beauty, bouncy plants, and few if any pest or weed problems.